Goodbye Mexico: Poems of Remembrance is, at its heart, a series of poems of love for the nation and lament for the loss of fluidity of the U.S Mexican border. This border, once porous and easy to cross both ways, is now a site of political turmoil, violence, and danger. 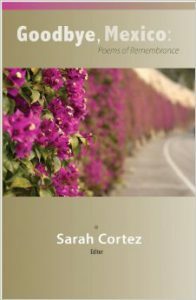 Written by numerous, talented poets with various relationships to the nation of Mexico, this collection offers a vast array of perspectives on a country that’s at once beautiful and ugly, filled with wealth and poverty, peaceful and ravaged with violence. Goodbye, Mexico: Poems of Remembrance is an expertly curated anthology that both celebrates and mourns this rapidly changing, vibrant nation. Like the killing never wants to stop. These two portraits of Mexico, this abrupt shift in tone, make readers feel the tension that exists in the borderlands. My favorite poems in this collection are the poems that paint a portrait of Mexico that’s authentic, showing at once its shadow and its light. The poem, “Portrait of Mexico,” personifies the nation as a woman with brambles for hair, thorns in her ear, a mouth filled with hornets. It’s a difficult place, though, too, filled with beauty: “Your iris smells of cinnamon bark, your hair-bound / forest of coriander.” The speaker sees beauty and strength in this image, and in the end, accepts the image for what it is. The poem ends with a particularly sensual image: “I want to taste the humming in your ear.” It isn’t an easy love, but what real love is? You win. You have always won. All I can do is not go away. Not go away is my name. This final poem digs deep and offers a solution. Instead of saying “Goodbye” to Mexico, the speaker refuses to do so, and instead, continues to fight by remembering the moments of joy along with the pain endured in this nation. In this sense, Goodbye Mexico is a powerful collection of poems written in numerous voices all with a similar goal – to complicate the narrative of a nation, to offer the only salve we know to be effective to this wound we call a border – poetry. Katherine Hoerth is the author of four poetry books. Her most recent, Goddess Wears Cowboy Boots (Lamar University Literary Press, 2014) won the Helen C. Smith Prize from the Texas Institute of Letters for the best book of poetry. Her work has been published in journals such as Pleiades, Borderlands: Texas Poetry Review, and Voices de la Luna. She teaches writing at the University of Texas Rio Grande Valley and serves as poetry editor of Amarillo Bay and Devilfish Review. She lives in deep south Texas.